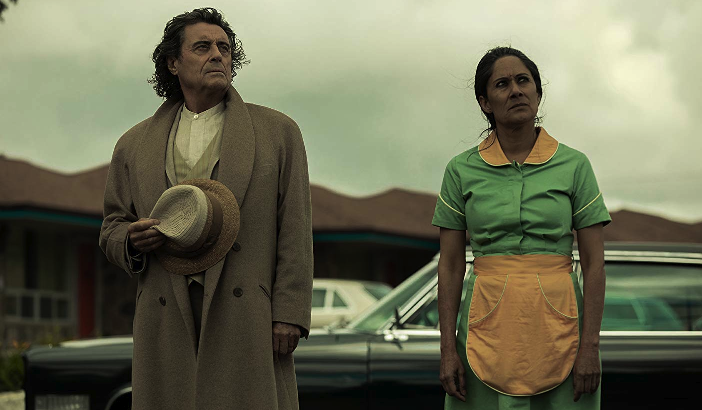 American Gods Season 2 continues its unpredictable path toward a war between the gods in “The Beguiling Man”, an episode that eases on the gods a bit and gives the spotlight to the mysterious Shadow Moon. We first find Shadow rigged up, being tortured by a New God by the name of Mr. Town. The god’s device forcibly dives into Shadow’s memories, introducing audiences to his sage, supportive mother and the challenges of his childhood. From the bullies who beat him in the park for being light-skinned to the police officers who arrested him simply for running down the street, he was never black or white enough for the world around him. Outside the diner, the Old Gods are still discombobulated. War now seems inevitable, especially with Czernobog still waxing poetic about his need for revenge. Even the reluctant Mama-ji agrees, though she’s not ready to act without a plan. On that note, she sends the Jinn on a mission to find Odin’s spear, and there’s no way Salim is letting him go alone. Mama-ji returns to work, Salim and the Jinn hunt the spear, Czernobog leaves with Zorya Vechernyaya’s body, and Wednesday and Anansi task off on a mystery task of their own. That leaves two outsides to their own devices. That’s right: More adventures of Laura Moon and Mad Sweeney! The chemistry between these two characters who hate each other (but maybe don’t) is one of my favorite parts of the show. Believing that the Old Gods have no intention of rescuing Shadow, Laura goes to do it herself and Mad Sweeney follows his lucky coin. It’s not long until their combined luck turns sour and they’re stranded on a country road. While hilariously changing out the tire, Mad Sweeney tells Laura about a woman who may be able to give her her life back. But will she ever get that far? Meanwhile, the New Gods are pretty quiet in this episode. Bilquis meets with Mr. World and tells him that she will not fight on his side, but he makes it clear that her refusal to choose a side might mean her death. A bit foreboding, but we imagine Bilquis will be harder to kill than Mr. World think. Technical Boy is out on a mission of his own: To hunt down a very reluctant Media after Wednesday’s attack scared her into hiding. The two run in the same circles, so it should be easy, but Media is tricky. He finds traces of her, but she refuses to come out and play. In mere flashes of greatness, Wednesday and Anansi are on a road trip of their own. 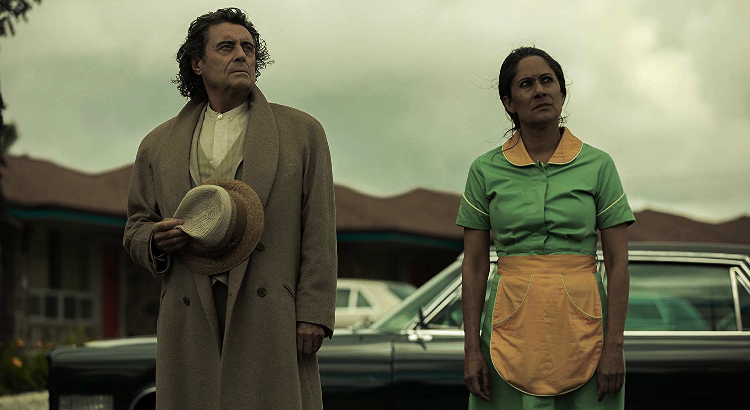 The audience don’t know quite where they’re going, but it doesn’t matter much– Watching Ian McShane and Orlando Jones play off each other is too much fun. Back in Shadow’s memories, we see how his life changed when his mother was diagnosed with cancer and he begins to feel genuine anger with the world around him. In the midst of it all, he has his first unknowing encounter with Mr. Wednesday. It all boils down to his mother’s heartbreaking death and the moment Shadow loses his faith. This feels so pivotal to understanding adult Shadow and his vigor to protect the Old Gods– by some very twisted means, Wednesday and the others have changed his outlook on faith. Unfortunately for Mr. Town, none of this gives him the answers he so desperately seeks. Laura and Mad Sweeney’s mission to catch with Shadow isn’t going well. However Shadow is traveling, it’s too fast for a car. When the two literally hit a dead end and Laura is crushed, Mad Sweeney reveals a trick up his sleeve and he unveils a (hellish) path through The Hoard that takes Laura right to Shadow– on a fast-moving train. Once inside, the two prove to be an excellent fight team! They take down several baddies to free Shadow, but as they get closer to Shadow, Laura takes down Mr. Town’s guards so violently that even Shadow isn’t cool with it. Finally, Wednesday and Anansi’s randomly-shown road trip reveals a rather amusing destination: The train track, where Wednesday parks his car Betty and bids her an enthusiastic farewell. As it all comes to an end, the train collides with Betty in a screeching mass of metal. While not quite the same shocker ending as last week’s episode, “The Beguiling Man” did a great job finding the balance between Shadow’s solemn memories and the quirky adventures of the other characters as they moved to find him. Diving into the depths of Shadow’s past was necessary for audiences to grow attached to the character and Gabriel Darku, who played young Shadow, gave a powerful performance. The relationships between Wednesday and Anansi, Laura and Mad Sweeney, remind us what these characters have invested in each other in the here and now. We can’t wait to see where the leads in the next episode! 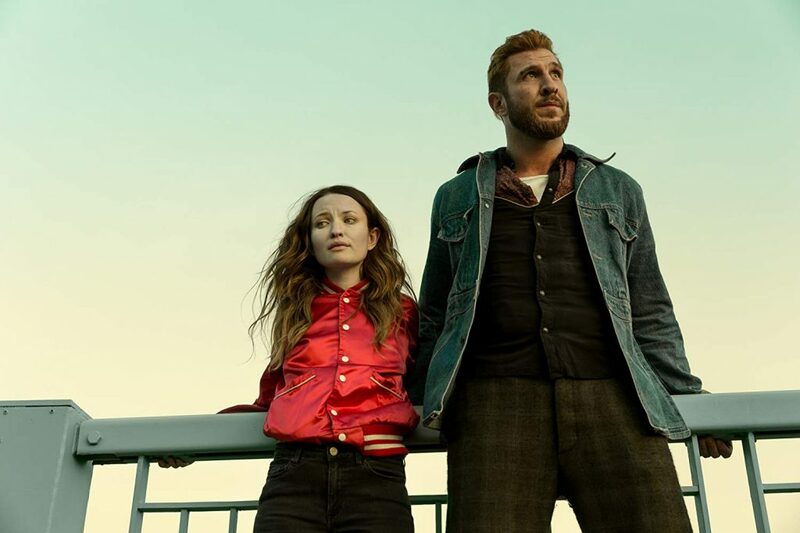 American Gods airs Sundays at 10pm EST on STARZ.